William F. (Bill) Mellberg, our long-time friend and co-editor of this website, passed away on April 18th after enduring an 18-month struggle with pancreatic cancer. He was well aware of the physical pain this disease produces, which he had to endure, because his mother also suffered with it in a year-long battle 17 years ago. But he faced his trials with equanimity, even humor, as he did with all the problems he faced in life. Fig. 1. Harrison H. Schmitt (left) with his website co-Editors, Bill Mellberg (middle) and Ron Wells (right) at the Chicago Club on the occasion of the Adler Planetarium’s 40th anniversary celebrations of the Apollo 17 Moon mission, November 14, 2012. Bill’s zest for life was eclectic, ranging from aviation, space, the Moon, technology, history, science, and the politics associated with those subjects— as well as politics in general. He was also an inveterate builder of model aircraft, rockets, spaceships (both real and sci-fi), and a collector of rare, vintage model kits. He was very knowledgeable in the history and circumstances of the many model companies which produced those kits. Growth in this wide ranging interest was heavily influenced by inheritance from his father, Frank Mellberg. Frank was the principal designer of the Bell & Howell lens system of the Surveyor television camera. 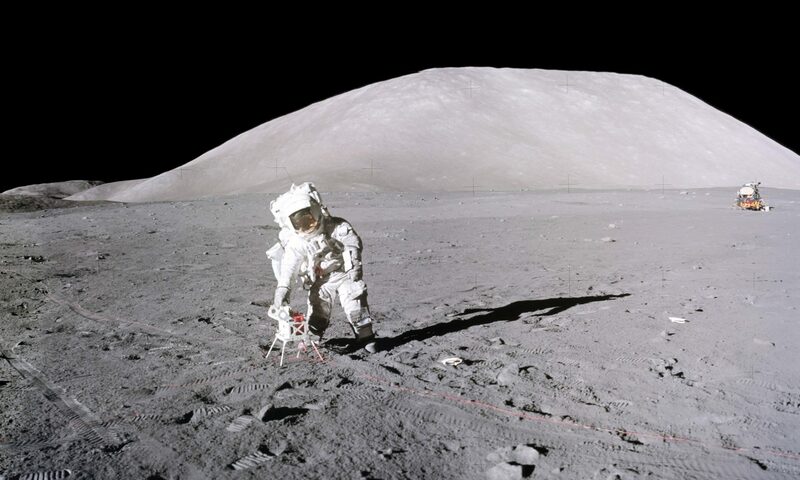 Surveyor was America’s first soft lander on the Moon; and Bill’s description of it can be found on this website as a PDF file in the right sidebar under “Editors: Mellberg – Downloads”. As a 14 year old, Bill fondly remembers riding with his Dad while holding Surveyor cameras on his lap as Frank drove out to the air freight area at O’Hare airport to ship them to Hughes Aircraft in Culver City where the spacecraft were constructed. Frank was also a consummate model builder, having scratch-built large scale models of the Surveyor spacecraft on the one hand and the Spirit of St. Louis and Northwest’s Hamilton Metalplane No. 20 on the other. The latter two are featured centerpieces in the Mitchell Gallery of Flight in Milwaukee. So the father’s capabilities also found expression in the son in one form or another. Fig. 2. Frank Mellberg in June 1966 with his 1/5 scale, scratch-built model of the Surveyor I lunar lander carrying the television camera system he engineered while at Bell & Howell Co. in Lincolnwood, IL near Chicago. To the right is a breadboard model of the camera and lens system. Fig. 3. The 1/6 scale model of the Ryan NYP “Spirit of St. Louis” built from scratch by Frank Mellberg and hanging in the Mitchell Gallery of Flight in Milwaukee, WI. After graduating with a B.S. degree in Business Administration from the University of Illinois at Urbana-Champaign, Bill joined Fokker Aircraft USA as a marketing and public relations representative. He moved on to Ozark Airlines in 1977, and afterwards formed his own company selling aircraft parts and supplies for local airlines. Bill was forced by the general economy of 1980 to develop an avocation he had from his high school days and become a humorist, impressionist, and a political satirist, as well as a public speaker. His ability to duplicate the voices of well known, as well as little known personalities, was uncanny, ranging from various Presidents and Congressional members to Hollywood actors and a few of the astronauts. Julia Child was the only female impersonation he attempted, and he said it made him feel like Milton Berle in drag (he also impersonated Milton Berle). He was adept at making Ed Sullivan sound funnier than he was (or attempted to be); and his Jack Benny impersonation in front of Benny himself brought the deadpan Benny-styled comment: “Say… that’s good, kid!”. Bill was also very proud of a plaque presented to him, which read in part: “Presented to William F. Mellberg, who sounds more like Paul Harvey than Paul Harvey. Signed: Paul Harvey”! But perhaps one of his most favorite appearances was at a White House Gala in front of President Ronald Reagan and Nancy in 1991, both of whom laughed along with the audience at Bill’s impersonation of the President. In fact, Bill maintained a website: “An Evening with the Presidents”, which sampled some of his political satire. He also had a weekly radio program of political satire and banter with two announcers at ESPN Radio 93.5 until his illness forced him to give it up. Fig. 4. Bill Mellberg with Nancy and President Ronald Reagan on the occasion of one of Bill’s performances at the White House. The President was one of Bill’s favorite impersonations on his many road trips, including a program for the opening of “The Ronald Reagan Trail”. The “Trail” is a tourist route in Illinois which links Reagan’s birthplace in Tampico, his hometown in Dixon and his college town in Eureka. Bill wrote numerous aviation articles for magazines, and published two aerospace books, Famous Airliners (1994, 1999) and Moon Missions (1997). He also delivered many public speeches usually on the subject of aviation history— a close friend was Jim Floyd, whose principal designs were the Avro Canada C-102 Jetliner and the CF-105 Arrow (not to mention Floyd’s involvements with the British Lancaster and the Concorde). In 2004, Bill gave the keynote address in Toronto at the 55th anniversary of the Jetliner’s first flight in 1949 with Floyd present in the audience. It was so well-received by all that Bill was invited back to give the keynote address 5 years later at the 60th anniversary. Bill was given a special model of the Jetliner after that first address. Later, he was given a large print of the Jetliner autographed by Floyd and several pilots and flight engineers still living, who were associated with the aircraft. It was drawn by the aviation artist Bob Bradford, also a former Director of the National Aviation Museum in Ottawa. Fig. 5. The 1/72 scale model of the Avro C-102 Jetliner given to Bill Mellberg after his 2004 keynote address at the 55th Anniversary of its first flight. Fig. 6. Bob Bradford’s magnificent rendition of the Avro C-102 Jetliner given to Bill Mellberg with Jim Floyd’s autograph at bottom right of center. As an aviation historian, Bill had special feelings about the demise of the Jetliner and the Arrow, as had many others in Canadian aviation history. But he took comfort in the fact that many of the Avro Engineers schooled by Jim Floyd wound up working for NASA and the Apollo program. Fig. 7. Bill’s first Regimental Dinner with the RCMP in Ottawa, Canada in 1987. At all other dinners Bill attended, he was similarly clad in a scarlet Mountie uniform. In return for the award and honor that the RCMP made to Bill in 1987, he used his talent to construct a 1/24 scale model of the RCMP de Havilland Canada DHC-2 float-plane, called the “Beaver”. It was presented to S/Sgt. Joe Roenspies for display in the Headquarters Senior NCO’s Mess. S/Sgt. Roenspies had nominated Bill for the honorary membership in the RCMP. Fig. 8. S/Sgt. Joe Roenspies of the RCMP beside the display case in the Senior NCO’s Mess in Ottawa, Canada with Bill’s model Beaver as the centerpiece. The DHC-2 was a chief work horse bush aircraft of the RCMP Air Division since 1949 with variants thereafter. It is also the favorite aircraft flown by the actor Harrison Ford. To acknowledge the rare honor bestowed upon him by the RCMP and as an expression of his enjoyment of the beautiful countryside in Canada through which he traveled, Bill chose to be buried in his scarlet S/Sgt. Mountie’s uniform. Some of us know, however, that Bill also had a twinkle in his eye, because he knew that some things “you can take with you”! The one thing that he did not plan on was his death on tax day, April 18th, cheating the taxman in the old phrase that in life there are two things you have to do: “die and pay taxes”. He had the last laugh after all! Bill’s life was extraordinary, touching as it did so many people in so many ways. Awards, signed photos, honorary memberships, friendships with notable people are a testament to how he so easily (and graciously) affected those who had the good fortune to know him. Of course, he would always look at that the other way around— that he was so fortunate to have met and known so many dignitaries as well as ordinary people. Those who were his friends, while saddened by his passing, were also enriched by having known him. But all of us recognize that he has now witnessed the handiwork of God in the heavens which we all strive to reach.